1) It was — or seemed to be, anyway — the prevailing view, outside of South Florida. I was hardly alone in hating The Decision. Mainstream sports fans were turned off by it, and cheered against the new and improved Miami Heat. When they choked away the 2011 Finals, America was delighted. A book was written about James, titled, “The Whore of Akron.” A lot of people bought it. In a matter of minutes on that fateful Thursday night, LeBron went from popular sports hero to reviled sports villain. 2) It was entirely irrational. Outside of Cleveland, anyway. There is no reason that a sports fan who doesn’t have much interest in the success or failure of the Cleveland Cavaliers or the Miami Heat should care whether LeBron plays in one city or the other. He was a free agent and made a choice. The entire sports world waited anxiously for the news, and LeBron channeled that interest in a way that raised millions of dollars for charity. 3) It represents the type of faux outrage described by Klosterman as an essential part of being a successful critic. LeBron might be the greatest player to ever live. His Decision shifted the entire landscape of the Eastern Conference and NBA. If we let something trivial like — you know — basic logic, get in the way of attaching meaning to this event, there begins a slippery slope toward calling the entire business of sports fandom into question. Put simply: Love it or hate it, The Decision had to carry meaning beyond the win/loss column and championship rings. Patrick J, what say you? Patrick J: There’s no reason not to cheer for them. In fact, there’s every reason to cheer for them. First of all, as annoying as The Decision was for the way ESPN sold it, LeBron’s handlers bought it, and LeBron bought into it, I never really blamed LeBron. He didn’t know what he was doing–until it was too late. But yeah, it was a car crash in slow motion. Eek. The thing is, at the time, Dwyane Wade was my favorite player. LeBron James was my second favorite player. Miami is a cool city. I think that’s what the NBA and ESPN and LeBron’s handlers were counting on people to think. And as disgusting as The Decision-as-reality-tv-advertising was, I think that’s what all the stakeholders wanted–and expected–people to think. And to buy into. But as we know, there was a big backlash, because they did it all wrong. People saw through it. LeBron wasn’t the personality to carry it out. He’s not really that kind of guy. He’s just not that phony. He’s still somewhat immature, but at least that’s him. I accept that. And like that he now appears to be more comfortable being him. That’s part of why I let The Decision go, and just enjoyed the Heatles from Day 1, even though as much as I liked Wade and James individually, it took a long while to warm up to them as teammates, because they aren’t natural complements. On Beasley and Oden: We at Punch-Drunk Wolves have been on record as card-carrying Beasley supporters since he was a Timberwolf. And, hey, we aren’t shy in admitting this– we like pure talent, even if it comes with fatal flaws. Which means that we also have a somewhat unhealthy infatuation with Greg Oden. We’re taking bets on what’s more unhealthy, our infatuation or Greg’s arthritic knee condition. You already know the score. The Heat amnestied Mike Miller–a bona fide p*ssy whom we came to loathe during his non-shooting times in Minnesota, and whose “I’m down writhing in pain look at me” acting jobs should qualify him for a remake of PLATOON (or TROPIC THUNDER (!)). And they added two of our favorite players who were out there left for dead–Super Cool Mike and Greg O–so we’re even more intrigued with the Heat than we were when it was purely an ESPN experiment. What’s not to like? (Eds. Note: And it goes a somethin’ like this…) RICKY BUCKETS! After playing such a pivotal role for the Tankapalooza All-Stars in Miami, Ricky has a rare chance to become one of the biggest losers in the history of sports. Some relevant stats for you: He has played in 661 career regular-season games but only 10 career playoff games; he has been traded five times; his teams from 2001-2008 finished a combined 175 games under .500; he has played for a 17-win team and a 14-win team; and he has had 224 different teammates told by a coach or front office official, “Look, you’re not allowed to hang out with Ricky after 10 p.m. under any circumstances, are we clear?” The best part? He’s only 29! He still has four or five more teams and the inevitable Clippers’ stint in him! Has anyone ever lost 1,000 career games before? Simmons was spot on with that Buckets-on-the-Clips prediction. We once saw him in his Clips uni and in a rather unusual setting. Andy G and I had “backstage passes” to a Wolves game (basically, a behind-the-scenes tour at halftime, that extended into much of the third quarter), invited because we were active participants at the Canis Hoopus blog. We walked through the locker room, the training room, etc–we got to see where Al Jeff and others were trying to heal their various woes–and then we walked through the tunnel back toward our seats. En route–and this was mid-third-quarter of the Wolves-Clip Joint game, mind you–we encountered Ricky Davis walking down the tunnel, not on the Clips bench, as would be expected from a key bench contributor, but rather as a player who appeared to be coming from the Timberwolves’ parking area, where he *might* have been doing nefarious things–and knowing Ricky, as a good-time guy, who’s to say he wasn’t doing nefarious good-time guy things? *All we could observe was the guilty grin on Buckets’ face as he passed by the confused admirers standing in the tunnel, in his path *back to the arena*. Given Ricky’s checkered history, it’s somewhat amazing that he’s now looking at another chance at an NBA squad. I'm hearing that Gilbert Arenas has looked good in workouts this summer. The Clippers may invite him to training camp, according to sources. What can we say–we like who we like. We’re fans. It’s entertainment. Oh, and yeah–it’s going to be a very fun season. You have it all wrong. 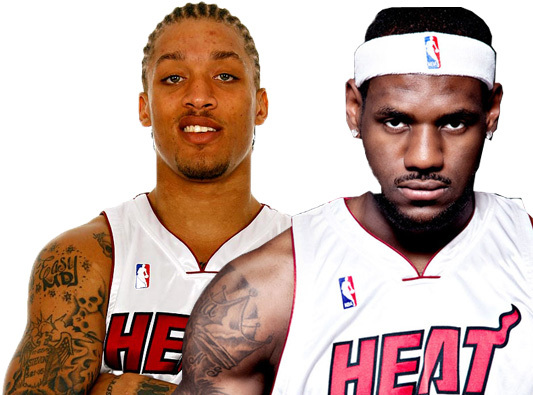 The heat are hated because they are given star treatment. It’s because they can get away with fouls and cheap shots that other teams cannot due to league politics. Then, in addition to receiving the star treatment, they are one of the more petty teams in the league. Shane Battier, Chris Anderson, Haslem, and Wade are all cheap shoot thugs. I didn’t used to think of Wade that way, and maybe I missed it, but during both the ’13 and ’12 seasons he’s flat out attacked players with the obvious intent of hurting them while not being called on it. As far as James goes, I’ve actually warmed to him. But when I hated him that was perfectly rational as well. I used to hate him because he symbolized flash over function. He played for highlights and often made teams worse by being on the floor. But as you said, he’s matured, and at this point he is better in both terms of play and character than his team mates.